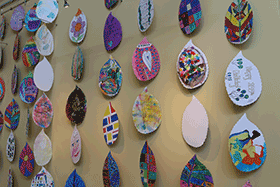 The Jewish Federation of Cleveland is proud to be a sponsor of the 100 Leaves Project, supporting the City of Beachwood and Beachwood Schools. To celebrate 100 years, Beachwood is honoring its achievements and reflecting on its roots with a public art project. Similar to projects like the Cows of Chicago or Crabs of Baltimore, Beachwood High School Junior Achievement partnered with the City of Beachwood to create the Leaves of Beachwood. Named for beech trees that originally covered most of the 5 square mile village, Beechwood became known as Beachwood. 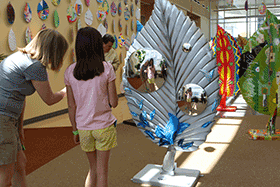 The six-foot fiberglass beech leaves are two-sided and weatherproof. Community individuals, business and non-profits were invited to sponsor the leaves. 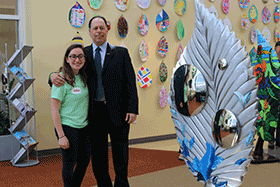 Hannah Frayman, a Beachwood student, reached out the Federation, offering the sponsoring organization the opportunity to secure their own artist or choose from a portfolio of various designs. The Federation chose local artist Sara Hurand, who developed a meaningful concept for the community non-profit. 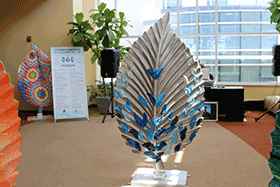 The leaf features many shades of blue leaves and mirrors. 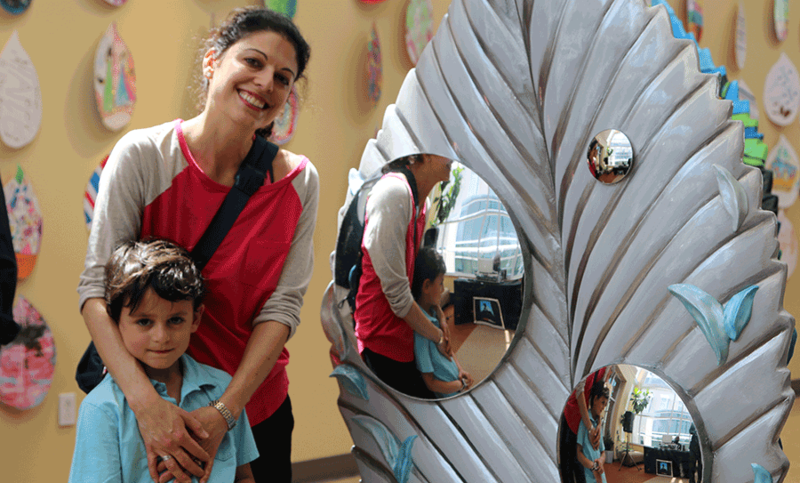 “I chose to use mirrors because everybody can see themselves in this community,” said Hurand. 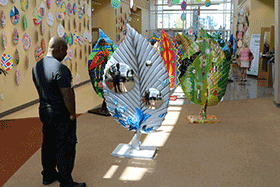 All the leaves will be on display from April to June 2015, at Beachwood City Hall and Beachwood Place. After leaving Beachwood Place, the leaves will return to their sponsors to be displayed at a business, home, or garden. In order to replenish the beech tree population, Beachwood Junior Achievement will also be selling living beech trees. The trees average 6 – 9’ each in height. 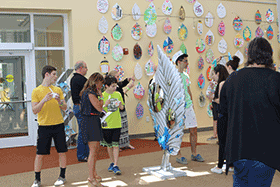 Proceeds from the sales will be used to create artistic murals celebrating Beachwood’s proud history and to fund the Junior Achievement Company Program.